Found this in Pinterest and wanted to share it with you guys! Love the color!!!! looks very fresh and modern even if it was made in 1920!!!! YES 1920!!!! LOVE IT even more!!!! 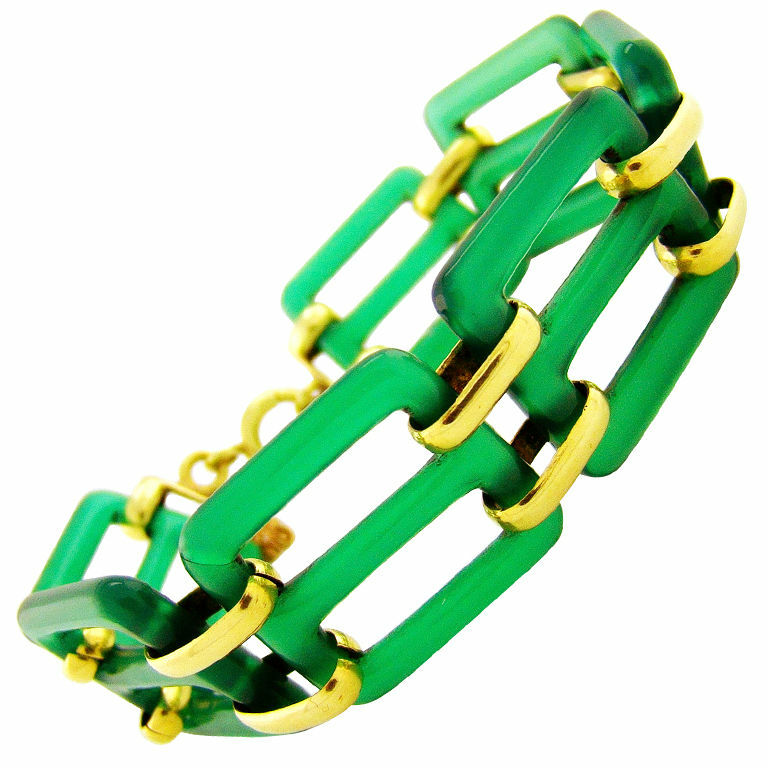 Art Deco bracelet from 1920, fashioned in the style of the time with chalcedony links that seem to glow green. The bracelet is handmade with 18k yellow gold. That’s the question many people ask, and I have to admit sometimes I ask it myself too. I mean is much more easier and cheaper to buy something mass-produced, BUT wait a minute … is my incredible piece of jewelry mass-produced going to last??? I know that right now is looking pretty good BUT is it going to stay like this for the next year for example?? Mmmmmmm not sure about that!! That’s one of the most important reasons why I always prefer to buy handmade. Also because I want my jewelry to be special, unique and different. When I have a piece of handmade jewelry between my hands :O !!! I feel the love and all the care that the artist had to make that piece, because at the end of the day it’s always going to be more precious to have something made from an artist hands that something made by a machine.